Hossen Sohel: A vigilance team comprising of transport owners and workers yesterday began checking vehicles at Dhaka’s Manik Mia Avenue where Bangladesh Road Transport Authority (BRTA) also conducted drives simultaneously. 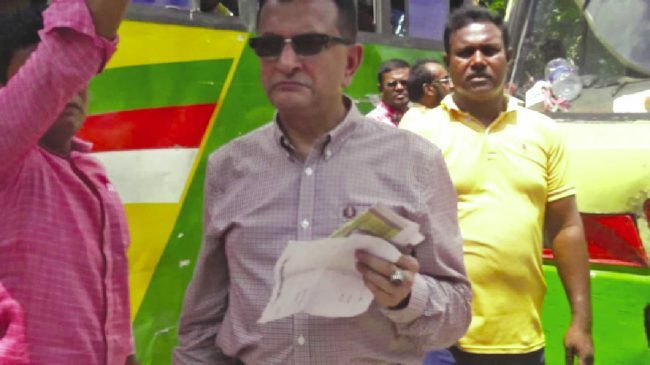 The representatives of the transport owners and workers started the drives against unfit vehicles, said Khandaker Enayet Ullah, general secretary of Dhaka Road Transport Owners’ Association who is leading the vigilance team, reports The Daily Star. They are checking whether anyone is driving buses on ‘contract basis’ or without valid documents, said Khandaker Enayet Ullah.